• There are five ducklings in Little Quack's family. They are Widdle, Waddle, Piddle, Puddle and Little Quack. • Little Quack is not related to Daffy or Donald. • Derek and Lauren Thompson, the author of Little Quack, never met or even talked to each other during the making of the first two Little Quack books. They finally met in 2003, after the paintings for Little Quack's Hide and Seek were completed. • Derek completed the paintings for the first Little Quack in only 40 days. • Each of the other three books, Little Quack's Hide and Seek, Little Quack's Bedtime and Little Quack's New Friend took three months to paint. • All four of the original Little Quack picture books were painted consecutively over a two year period beginning in early 2002 and ending in late 2003. • Ten different colors of paint were used to paint the pond water in the Little Quack books. • The paintings for the first Little Quack were shipped out in a snowstorm in March 2002 (Derek lives in Minneapolis) and the paintings were lost. They were supposed to have arrived the next day. They finally arrived at Simon & Schuster in New York City five days later. • Derek no longer ships his paintings out in snowstorms. 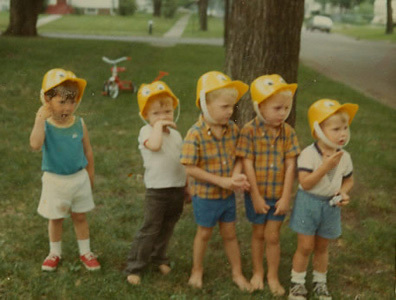 • When Derek was little, he and his friends all owned duck helmets. There were even five of them (That's Derek on the far right). He didn't remember this picture until after he'd illustrated the Little Quack books. Was it destiny that he would illustrate Little Quack? • The original title for Little Quack's Bedtime was supposed to be Little Quack's Sleepy Time, but Simon & Schuster changed it. 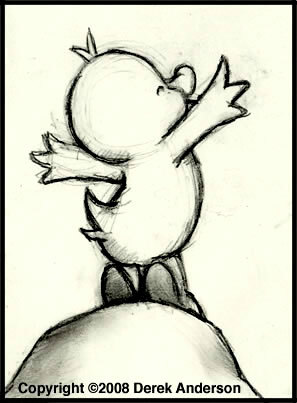 • In Little Quack's Bedtime, keep an eye on Waddle. He likes to sleep with his mouth open. But Widdle and Piddle think he has bad duckling breath. • While Derek was working on the sketches for Little Quack's Bedtime in the summer of 2003, a terrible thunderstorm struck Minneapolis and the power was knocked out for three days. Derek spent an entire day outside cleaning up debris and by evening it was too dark to work. The deadline was closing in fast, so Derek set up every candle he could find on the kitchen table and worked late into the night. Derek's kitchen was so bright that when a neighbor arrived home at 1:00am, he thought Derek's power was back on. The neighbor called Derek and asked if he could run an extension cord across the street for his refrigerator. Derek did end up finishing the sketches on time, but several sport wax drippings from his candlelit work sessions. 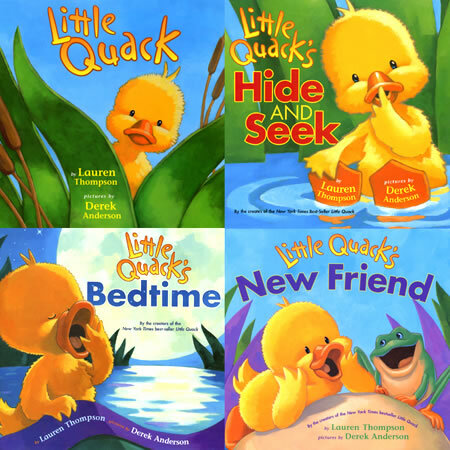 • Small "child-sized" copies of Little Quack and Little Quack's Bedtime were each distributed in more than a million boxes of Cheerios in 2005 and 2006. It was a part of "Spoonfuls of Stories," a literacy initiative program sponsored by Cheerios and First Book. • Little Quack was a New York Times Bestseller. • Both Little Quack and Little Quack's New Friend were IRA/CBC Childrens' Choice Award Winners. • Both Little Quack and Little Quack's Bedtime were awarded the National Parenting Publication Gold Award. • The Little Quack books are available in a number of countries around the world including Canada, France, Germany, Spain, the United Kingdom, South Korea, the Netherlands and Japan.